When Apple made plans to convert an empty Mesa building into its $2 billion Arizona Data & Global Command Center, the technology giant knew it wanted the building to run on 100 percent renewable energy just like the rest of its facilities. And what better way to do so than build a giant solar farm? The makers of the iPhone partnered with the Salt River Project and other Arizona groups in 2014 to find space for the project. The team found a spot in Florence to build the 282-acre, 50-megawatt Bonnybrooke solar farm that became operational in December 2016. Apple made an agreement with SRP that year to sell the utility 50 megawatts of energy produced at Bonnybrooke. The approximately 144,000 solar panels in the array produce more than 147 million kilowatt-hours of energy per year, according to Apple. Gov. 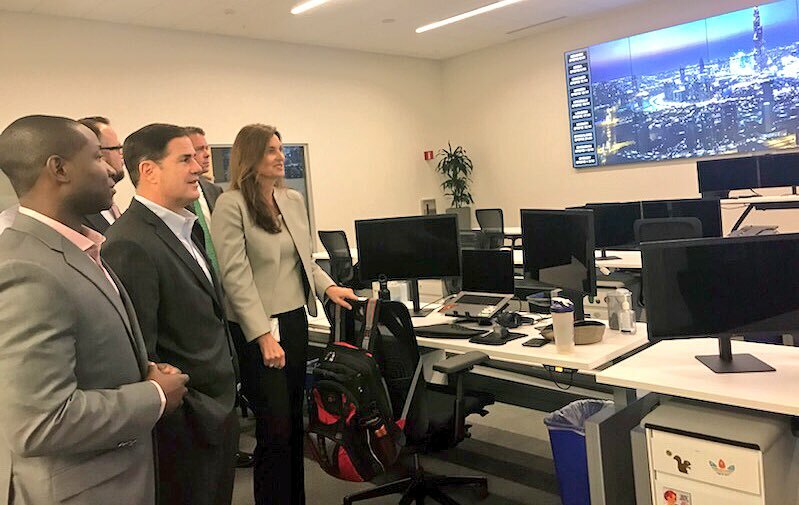 Doug Ducey tours Apple’s Data & Global Command Center with company executives during its opening. The 25-year agreement helps the utility reduce its carbon footprint and supports renewable energy development in the state, according to the utility. SRP purchases the solar power at a wholesale rate, meaning it doesn’t affect its 1 million customers’ bills, and Apple retains the environmental credits from the project. Apple considers renewable energy an important value to its business. The company announced in April 2018 that all its global facilities were running on 100 percent renewable energy, including retail stores, offices and data centers. “We’re committed to leaving the world better than we found it. After years of hard work, we’re proud to have reached this significant milestone,” CEO Tim Cook said at the time. The Bonnybrooke solar field produces more than enough energy needed to power Apple’s Mesa center. In fiscal year ending Sept. 30, 2017, the building was supported by 45 million kilowatt-hours of renewable energy—the same amount used by 3,640 Arizona homes. The 1.3 million-square-foot building was first owned but never used by First Solar. It was then bought by Apple and occupied by a glass supplier that filed for bankruptcy in 2014. After talks with the city officials, Apple decided to bring its data center to Mesa. “All of Apple’s iCloud operations—music, health, everything else that touches most of our lives literally all the time—is going through this building, and Apple talked about how pleased they are with the quality of the workforce they were able to find here,” Mesa Mayor John Giles told Covering Mesa when the center officially opened in August 2018. As of August, Apple had 1,100 employees in Arizona and supported 30,000 jobs in the state, according to Mesa officials.